This stunning Amish Meredith's Hoosier Hutch is a traditional country style hutch that will bring a warm and inviting feel to your home. This beautiful hutch is a dream come true for those who live for food and cooking! Choose your wood type from a variety of premium North American hardwoods including Oak, Brown Maple, Cherry, Hard Maple and Quarter Sawn White Oak wood. Also, choose a stain type to complement the wood and to bring a custom look to your hutch that will match your home decor and personal style. This lovely hutch also features mullion door detailing on the top two display doors, a unique roll up bread box that will conceal the contents of the center opening, and a slide-out serving tray that provides additional serving and food prep space. This hutch has plenty of storage space for all of your china, cooking supplies, cookbooks, and everyday dining & kitchen essentials. 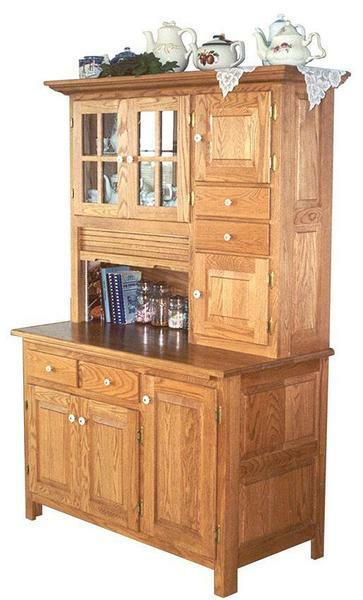 Contact our DutchCrafters team of knowledgeable Amish furniture consultants for additional information or custom ordering assistance on this gorgeous solid wood Amish Meredith's Hoosier Hutch. We can even send you wood and stain samples upon request to make your decision process a bit easier. Shown in Oak with 4569 stain.